NBC's Andrea Mitchell, on Thursday's, "Today" show cheered an added benefit to the release of Euna Lee and Laura Ling from North Korea, was that it reunited Bill Clinton and Al Gore. In a segment headlined, "Together Again, Clinton and Gore's Emotional Reunion," Mitchell - who is traveling with Secretary of State Hillary Clinton wherever she goes these days - hailed that the event brought back the "Boomer buddy team," and gushed "Both are now international superstars." Before the Mitchell story, "Today" anchor Meredith Vieira, gleefully teased, "It was like a flashback to the nineties," and observed that both Gore and Clinton were, "Smiling. It was good." MEREDITH VIEIRA: And just ahead we're gonna take a look at the other reunion that took place on Wednesday between Bill Clinton and Al Gore. It was like a flashback to the nineties right? LESTER HOLT: Yeah. Haven't seen the two of them together in a long time. VIEIRA: Smiling. It was good. MEREDITH VIEIRA: And now to the other story coming from the release of U.S journalists Laura Ling and Euna Lee - the reunion of former President Bill Clinton and his Vice President Al Gore. NBC's chief foreign affairs correspondent Andrea Mitchell is in Nairobi, Kenya, where she is traveling with Secretary of State Hillary Clinton. Andrea, good morning to you. ANDREA MITCHELL: Good morning, Meredith. Well behind the drama of this week's events, there was another story. A political reunion of two former partners who had drifted apart, until now. OFF-SCREEN VOICE: Laura Ling and Euna Lee. MITCHELL: It was an emotionally charged moment, a triumph of diplomacy. A tearful family reunion for the two newly freed journalists. And for the men at the center of it, a very public reunion. AL GORE: We want to thank President Bill Clinton for undertaking this mission, and performing it so skillfully. LAURA LING: We saw standing before us President Bill Clinton. MITCHELL: -so did his old friend Al Gore. In his statement, President Obama thanked both men three times. BARACK OBAMA: All Americans should be grateful to both former President Clinton and Vice President Gore, for their extraordinary work. MITCHELL: Clinton and Gore, back on the international spotlight again. A reminder to some of the different time, almost two decades ago, when the two campaigned across the nation. A Boomer buddy team. But following Clinton's admission of an affair, and impeachment in the tumultuous second term, all that changed. DEE DEE MYERS, FORMER CLINTON PRESS SECRETARY: I don't think there was a one particular point where it started but it was something that, you know, existed and at times festered over a period of years. 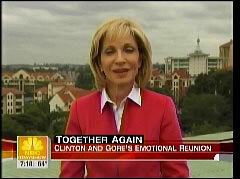 MITCHELL: Gore blames his defeat in the 2000 election on the former president. Clinton attacked Gore for pushing him into the background during the campaign. For years the two men went their separate ways. But when Gore called Clinton to ask for help, to free the two American journalists, the former president didn't hesitate. JOHN HARRIS, POLITICO: There is a fraternal-like character to this relationship. They're like brothers who don't always get along, but at the end of the day they're still brothers. I don't see this as the case of these guys getting the band back together for a reunion tour in which it's gonna be Clinton/Gore again. MITCHELL: Both are now international superstars, Gore a Nobel laureate. But the homecoming that they engineered together this week has to remain one of their best joint ventures. Meredith? VIEIRA: Alright, Andrea Mitchell, thank you very much.